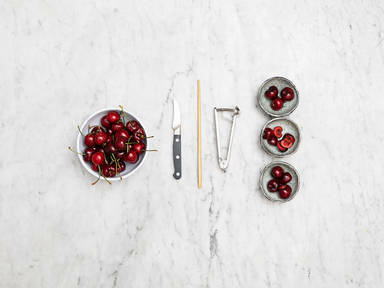 To remove cherry pits with a knife, slice lengthwise through the cherry and pluck out the pit. To use a cherry pitter, place a cherry in the holder and press down firmly to remove the pit. Place a cherry, stem side facing upwards, over the opening of an empty bottle. Push the chopstick down through the center to remove the pit.